This nautical inspired candle summons up visions of summer holidays at the seashore. Perfect for Father’s Day! 1. 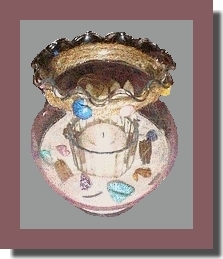 Hot glue the glass votive or candle cup in the center of your fish bowl or ivy bowl. 2. Pour in sand, to a depth of about 1/3 the depth of the candle cup. 3. Insert some of the sea glass and drift wood, rocks and shells on top and into the sand. 4. I paint a miniature picket fence in white, let dry, then brushed on some glue and dipped it into some sand, as if the sand had washed up onto the fence. If you choose to do this, place the little fence in the sand at an angle. 5. I also made a catcher’s net by making a small circle of wire, twisting the ends together. Leave enough wire at the end to insert into a small piece of dowel. Hot glue a small piece of onion net onto the hoop. Make a hole in the top of the dowel with a small nail, then remove the nail and hot glue the hooped net into the dowel. I chose to hot glue this little fisher’s net to the end of the fence. 6. Loop hemp twine around the neck of the jar, about three times, then tie in place. Hot glue some left over shells on the rope and pop your candle in and Enjoy !